Andrea from All You Need Is Love and Cake is giving ten great tips for a throwing a BBQ on a budget. I especially like the idea of filling guests and family with tasty and inexpensive salads and sides. She also shares a fabulous recipes for mini picnic quiches that little ones can help prepare. A very clever way of getting them to eat their vegetables! ‘Oh how clever!’ is what I thought when I read through the 10 fun science activities for hot days that Emma from Science Sparks has come up with. As a teacher Emma knows how to make science fun and interactive and with activities such as mixing colours for slushy drinks, she will convince even the biggest science grouch that learning can be fun – even during your summer holidays. One of the biggest public affairs of this summer will, no doubt, be the birth of the royal baby. Kate and William will be covered in presents and flowers, but if you want to send the new parents a little note to congratulate them on the birth of their baby, then you will have to make it personal by sending them these Royal Baby Fingerprint Cards that Kelly from Domestic Goddesque made with her girls. Aren’t they just adorable? Sandy from Baby Baby Blog has also been creative. She has made some wonderful cards and gift tags for her teacher presents by using the leave rubbing technique that her boys have recently learned in school. So get outside, pick up some leaves or other objects with an interesting texture and see which designs you can come up with. Liz from Me And My Shadow also wants you to get into nature for a fun and educational activity that teaches kids how to make their very own DIY Flower Petal Paints. So put your shoes on, collect some petals and get painting! I’d love to see your masterpieces at the end of summer! Seeing that the last two or three summers were not really spoiling us with beach weather, the one or the other might have forgotten what to get up to on the beach. Helen from Actually Mummy and her funny sidekicks have filmed a lovely video reminding you of all the fun things to do on a beach. I still love writing my name with sea shells at the grand old age of 24+4, so give it a go! If you prefer a dip in the pool, then why not take a deep breath, and jump into the blue? Actually Mummy’s little man shows you exactly how to do it and if you don’t get it after his first jump, well let’s see it another 500 times! Fair play to Actually Daddy, who must have guns of steel after that workout! Natalie from One Busy WAHM won’t make you work out, thank God for that, but she brings you all her top tips for the summer in her post Bring On The Summer. Make sure to give them a read as she makes some important points about sun protection – an absolute must in this weather. A place where you really won’t have to worry about the sun this summer is the museum. 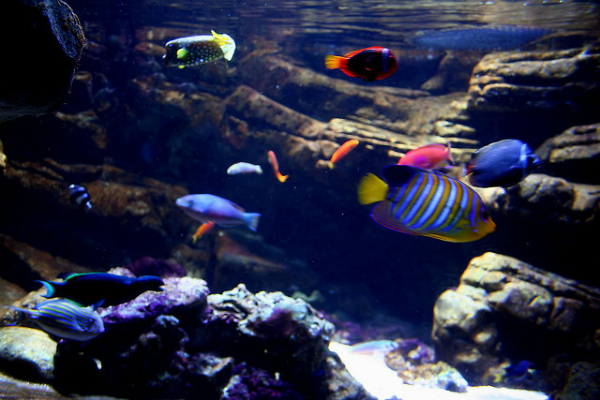 Jenny from The Gingerbread House tells you about taking her pre-schoolers to the London Aquarium and gives you some valuable tips for your own trip. Mari from Mari’s World also visited the London Aquarium and takes you on a virtual tour through all 14 sections of Sea Life London. Anyone fancy hanging out in the Ray Lagoon with me? No? Well what about a bit of train spotting at North Weald Station? Jenny from Treading On Lego escaped the huzzle and buzzle of the capital with her little family and spent ages on the platform watching the trains with them. Who doesn’t like catching some Thomas – The Tank Engine air? If you haven’t decided where to go during your summer holidays, then don’t fear. I have some lovely ideas up my sleeve for you. Before you hit the motorway or train though, make sure to install the following Top 10 Apps For Toddlers on your tablet or phone. They’ll make the journey appear much shorter for your little ones and will keep them entertained while you are stuck in the traffic – not that you will. I mean, who gets stuck in traffic in the summer? Okay, you might do, but some destinations are really worth the journey and Coombe Mill is one of them, if you believe the tales that bloggers tell when they return from their holiday with Fiona and her husband Nick. Kirsty is one of these bloggers. Read and see what she got up to on her holiday to Coombe Mill. Ruth from Dorky Mum takes her family back in time and enjoys a happy holiday in Harris, the most the southern part of Lewis and Harris, the largest island in the Outer Hebrides, Scotland and the island of her childhood. A post that perfectly sums up how stressful traveling with and sometimes even without children can be, is Departures v Arrivals: From One Extreme to Another, written by Sarah from Perfume & Trumps. It couldn’t describe any better how I feel when I come home after a holiday, but read yourself and let me know, if you’re in the same boat! Now, that’s it for today. I hope you liked this little round-up and its summery theme and I do of course hope that you have found some nice ideas for your own summer holidays. If you still need some inspiration, check out this fabulous Pinterest board from Mari with dozens of ideas for things for kids to do over the summer holidays. Enjoy, have fun and make memories! What a fab round-up! I'm so ready for the summer holidays now. What a fantastic round up – thank you for putting that together. Such a great ideas for the summer holidays! There are some great ideas in here, thank you! Thanks for the mention. There are so many brilliant ideas here, the Summer holidays are never long enough!